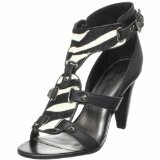 Add an exotic twist to your favorite summer-wear with this women’s Jubilant T-strap Zebra sandal by Beverly Feldman. Open at the toe and sides for plenty of warm-weather exposure, the smooth leather and haircalf sandal sports an animal-print vamp and riveted side straps, with an adjustable ankle cuff adding a slimming–and wearable–finishing touch. Other features include a gently padded insole, a naturally contoured footbed and a leg-flattering 3-1/2-inch heel. Recognized around the world for their unique playful spirit, Beverly Feldman designs have been a high-fashion staple since the 1970’s. Based in New York and Ibiza, these glitzy shoes are hand-lasted and stitched in Spain for the latest in European style. Discover the one-of-a-kind flair that’s made Beverly Feldman one of the most respected and sought-after names in the fashion world.